If you took time lapse photography in my living room you would see me sitting at the computer, frequently getting up to do things and sitting back down, with my husband and kids buzzing around me. Word problem for you: There are 4 members of the Hall Family, mom, dad, girl and boy. Dad and girl leave. Boy's friend arrives. How many people are left? Time alone at home? What an unexpected treat! Today's word problem: There are mom, dad, girl and boy in the Hall Family. Boy's friend spent the night. Girl went to a sleepover and spent all day away. Dad, boy and boy's friend went out. Dad and boy return. Later, girl comes home. Then dad and boy leave again. Who's home now? Did you notice that I am the ONE person who never left? I could cry laugh at this, thinking, jeez Jen, it seems you have no life. But while I may not have gone anywhere at all that weekend, I do get out. So it's really not about that. I'm the constant. I am the one all three of them can count on. I'm their go-to gal. The one who usually has the answer to, "Where are my shoes?" or "Whose bath night is it? ", and "Do we have any more toilet paper?" I am always the one to get up with the kids in the morning, and almost always also home to tuck them in at bedtime. I get them off to school, and again, almost always greet them when they arrive home. If I'm not, I make sure they know who will. My husband and children can count on me 100%. I truly hope we all get to feel special and loved. May your children, and mine, behave like the perfect angels we think they are. May someone rub our feet. May there be breakfast in bed and bubble baths, or whatever would make us smile. 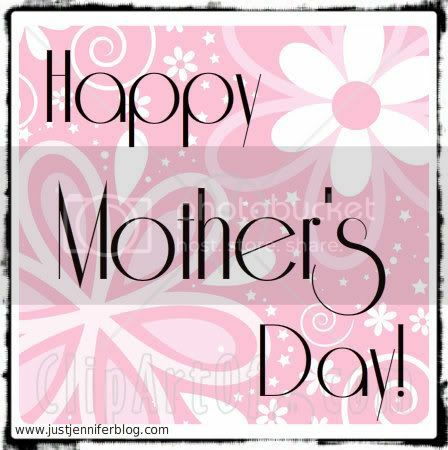 Today you can use either the Mother's Day blogCard or TGIF button. Grab one --> and link up! And then go read Dudes....put down the flowers and the stupid card. C'mere. at Food Good, Laundry Bad. Trust me. Oh, and also, Don't Let Mother's Day be Martyr's Day from DocG. I'm serious. Do it. "I am the constant." That is a powerful and meaningful statement. I have to admit, I first heard it on a TV show (Lost) and have loved it ever since. I get this, completely. I would much rather be the one greeting them when they get home than driving them all over creation. But usually, I do both. Such is life! Happy Mother's Day, Jen! And I wish I could drive them all over. Happy Mother's Day, Greta! Thanks so much for the shout out, Jen. Happy mothers day, friend!